I have a Kern Aarau wooden tripod, no model number on it, that came with a Kern Aarau theodolite (surveyor's instrument). It's a very fine piece of kit. 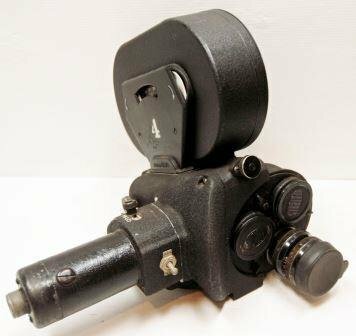 Could anyone tell me if they know if a movie camera fluid head could be attached to it. I'm thinking so far of a Ronford Baker fluid head. It would be used with a Bolex H16 and also potentially an Arri 2C. Thanks for any advice. Will take measurements if any further details are requested. Could even take some pics if necessary. To be useful, it's going to need to have either a 100mm or 150mm bowl, or a mitchell base. The mitchell base seems highly unlikely, as that's a film specific thing, but the bowl fittings are a possibility. Take some measurements, and some photographs. Photo 6 shows the bowl at the top. Looks like I can't use it unless I can get an adapter made up. Diameter of bowl at top (I'm assuming 'bowl' refers to the hole in the aluminium top, with the large hand-turned screw attachment underneath) is 40mm. Movie head bowls are of much larger diameter, you have entirely different tripods. With an Arriflex II you make things still more complicated in that you’ll need a hi-hat for it. I’d try to sell the Kern sticks and get myself a wooden Miller or Universal or O’Connor with a fluid head. I had a Universal from Sydney and loved it. Will have to think about getting a movie tripod. I was wondering about the hi-hat. Is one available that is possible to attach rods to for a hard front camera with larger lens and matte box? Most usual I think is to use a flat base motor attachment and just put straight on the fluid head. Still, I'd prefer to put the motor underneath and use a hi-hat if possible. The mechanical simplicity of that arrangement appeals to me. The arrangement is simpler with the Cineflex, the motor torque goes straight to the one-one shaft. It’s the same camera, more or less. Interesting, looks like a 'Sten' version of the 2C, if you know what I mean, or an Arri that got left in the sun too long and the motor oozed around to the side. Mechanically makes very good sense. Are there any disadvantages to using a flat base motor? Is it noisier? (not that that would really matter, since it's for MOS anyway). Can a base plate with rod attachments go between the fluid head and the flat base motor, if needed for matte box etc? This must seem like an obvious question but these things are all new to me. ... the Cineflex, the motor torque goes straight to the one-one shaft. Simon, I have one of those, though I would be scared to run it now, the grease might be all dried up....Maybe I'll quiz you or Dom on how to lube it or get it serviced later..
Used O'Connor 50D seems a good choice. Wonder how long these things last before no longer being smooth in pans. Are there any disadvantages to using a flat base motor? Is it noisier? Can a base plate with rod attachments go between the fluid head and the flat base motor, if needed for matte box etc? Of course. Some bases have the ⅜"-16 tap, some the ¼"-20. Thanks guys for the input and advice. Can someone advise if it should be possible to get an old rod attachment base plate and get a machining shop to cut a big hole in it for the 2C pistol grip motor to go through. Then use on top of a hi-hat.This would be my preferred set up if possible. Alternatively, it could be used with a Ronford Baker head that already has provision for the pistol grip motor to 'sit in'. "There is nothing factory made to do what you want. A zoom lens bracket will partially fill your requirements but there is nothing made that has a rod facility. The Arri 1 & 2 series never had a rod system but one could be made. I have one on my own custom flat base but its rods are on the side and offer no lens support. If you have a PV or a PL mount it is quite strong enough to hold pretty well all lenses up to about 300mm focal length. Beyond that you need a full cradle specifically made for extra long lenses"
When the Arri 2 series were developed zooms were virtually unheard of, they only started becoming generally available in the 60s, so lens support wasn't a design parameter. These were cameras primarily made for hand-holding. The flat bases were initially designed to fit the camera into blimps that had their own follow focus/matte box arrangements. When zooms did arrive, the elengated base that you can see in the pictures I posted in that other thread was introduced to support them, rather than a rod system. Making your own will require some planning since you want the rods to be positioned correctly relative to the camera lens port - matte boxes, lens support brackets and follow focuses are made to particular rod standards. The 2 series have facility for their own matte box connected to a top bracket, although the matte boxes tend to vignette on wide angle lenses. There might be more modern versions available. Photo 6 shows the bowl at the top. Looks like I can't use it unless I can get an adapter made up. Have you thought of using polymorph aka instamorph? You buy grains of nylon in a jar, dunk them in hot water, and they become moldable. If it's not strong enough by itself you can sometimes use it as an outer layer over a steel or aluminium core. It works especially well if you have a bolt-on solution that would fit but said bolt is a bit too small - you pack the socket with a still flexible wad of nylon, screw the bolt into it, and when it's cooled you have created an adapter. Excellent idea David. But I've figured out (I've got a lot of figuring out to do with these larger, heavier cameras) that the tripod just isn't big enough. At first I thought it was but a bit of experimentation peering at ground glass images has convinced me that something enormous and rock solid is required. The Kern tripod is pretty hefty but the actual theodolite that came with it is a tiny little thing - it fits in your palm. I didn't pay anything for it so that's good. Next project is to get hold of an old monster of a tripod, and fluid head, the bigger the better, and a light meter. Thanks Dom also for your always valuable input. Will think more on a custom rod system. ...Tripods made for monorails are really sturdy beasts and you can often pick them up cheaply. Can anyone advise what they think of this Miller? The pan arms seem to be fitted upside down - they will bump into underside of camera. A Miller 30 would be for 30 lbs maximum payload? Also, it says it's a "compact" tripod, maximum height 63". Do those legs look sturdy enough for a maximum 10kg payload? Not sure I would buy this but I'm interested in possibly getting a used Miller at a good price. There is a slightly smaller Miller head also that would be OK for your bolex but a bit small for your Arri II. Re support for the Arri II...is it possible to make your own little aluminum mount to accomodate the pistol grip motor that then sits on the tripod...a piece of aluminum, big C section with a hole in it etc. Have a look at what the aluminum supply shops have...theres normally someone who will sell cut lengths..
You can adjust the pan arm as you wish, it is clamped, and it stands away far enough to not interfere with the camera, believe me. Millers are well made, if you don’t mind their Australian heritage. Millers are well made, if you dont mind their Australian heritage. That's a good idea Gregg about the C section aluminium. I was never very big on the engineering side of things, especially involving metal work, but sounds like a simple project. I'm more of a woodworker. Maybe I could ask someone like Bruce McNaughton if they might be interested in making a rod system that would work with it, on this aluminium hi-hat. Just all in the planning stage at the moment as my attention is mostly on 16mm at the moment but I'm thinking it through.